2 in one week! We’ll be getting a name for ourselves. Rightly so. Sussex Transport are experts in the transport and offloading of items like water tanks. Whether they are steel or plastic, need dropping off for a contractor, or lifting into their final position you can be assured we have the solution for you. 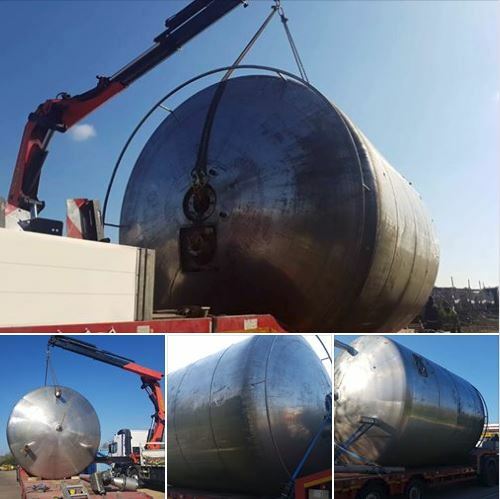 This week we have found ourselves in Bognor Regis, West Sussex at the wonderful Barfoots of Botley where we offloaded, lifted and positioned a new Hot water tank. For expert help with your lifting project then give us a call on freephone 0800915 23 23 or complete our contact forms to the right of this page. This entry was posted in Delivering to..., HIAB / Crane Lorry Loaders, News, Where are Sussex Transport going..., Where are Sussex Transport..., Working with... and tagged bognor regis, crane, hiab, palfinger, steel tank, volvo truck, water tank, west sussex. Bookmark the permalink.